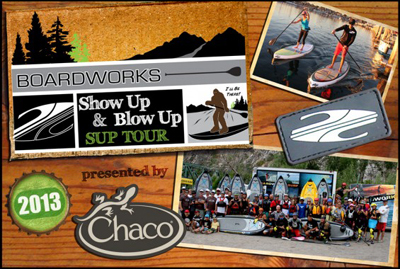 Working in conjunction with local retailers and shared brand ambassadors, the tour will encompass all areas of the sport from flat water and whitewater to coastal paddling and will consist of product demos, clinics, and races. The Tour began March 30 in Florida and continues on to North Carolina in April; Virginia and Colorado in May and June; Idaho, Utah and Montana in July; Oregon, Washington and California in August and California, Georgia and Tennessee in September and October. Born on the river in 1989, Chaco builds premium footwear and accessories for the outdoor-minded. What started as sandals for river guides has evolved into sandals, shoes, and boots that offer Chaco’s uncompromised support no matter where you roam. All Chaco footwear features the LUVSEAT™, a uniquely contoured platform that properly aligns and supports your foot and body to enable a lifetime of adventure. As a result, the American Podiatric Medical Association (APMA) has awarded the Seal of Acceptance to many Chaco footwear styles. The APMA Seal is intended to raise awareness by identifying products of exceptional quality that are manufactured with comfort, health, and safety in mind. Simply put, Chaco is fit for adventure. Chaco is a part of Wolverine Worldwide’s Performance Group that also includes Merrell, Saucony, Patagonia Footwear, and Cushe.